When Hans and I relocated from Chicago to Ann Arbor, we wanted to live in a house with a big yard so we could plant flowers and get a dog. There were two backstories feeding these wants. I grew up on a farm and we always had a dog or two. And having lived in Chicago three-flats for a decade, I was ready for some green grass. There were other things on our wish list, including enough space (to live in and for our stuff) and a garage (for the car and more stuff). And I think granite countertops might have been mentioned. After looking at a dozen houses, we found our home. By today’s standards, it was actually on the small side at 1,400 square feet (compared to the average size home of 2,500 square feet). There was a living room, family room, dining room, and kitchen. There were four bedrooms and two and a half baths. We don’t have kids, so that’s two bedrooms and a bathroom each—with half a bath left over! It seemed there was a separate room designated for every possible activity. And with so many rooms to choose from, it’s a wonder we ever ended up in the same room at the same time. Conventional wisdom says when you have space, you fill it up. And we did. We brought furniture from Chicago and we bought furniture in Ann Arbor. We went to home stores and container stores and hardware stores. We acquired things to fill the space. Whether we needed all that stuff wasn’t really discussed. We had the space and it needed to be filled (or so I thought back then). But a funny thing happened as we settled into our new home after years of apartment dwelling. We realized a couple things that would have been nice to have figured out beforehand. First, we hated yard work. Mowing the lawn felt like a huge waste of a weekend afternoon. My would-be green thumb forgot how much I dislike getting sweaty and dirty and toiling in the soil. But as we started to notice the disconnect between the dream of a big yard and the reality, we realized the doggie dream was much the same. We started to embrace this about ourselves: The less commitment and obligation in our lives, the freer—and better—we feel. Initially, this was really uncomfortable for me to admit. I worried not wanting responsibility and obligations made me less of an adult. But as soon as I have that thought, the record skips and I say WHHHAAAT?! Because I’ve realized being a mature adult is knowing who you are, what makes you comfortable in your own skin and at peace in your own mind—and then designing your life around what’s true for you. In our more-is-better consumer culture, it’s easy to buy into all the messages about what we’re supposed to want and supposed to have. But what if you get those things and … meh … they just don’t resonate. Then what? Because that’s what happened to Hans and me. Everything looked great from the outside, but just didn’t feel quite right. It took us awhile to figure out the disconnect between what we thought we wanted and what we really wanted. So, after the first year in our home, no flowers were planted. We paid someone to take care of the lawn. And I made sure to pet other people’s dogs whenever I got the chance. But… we couldn’t unknow what we now knew: We’re not house people. Or the landscaping-on-the-weekends type. And while we’re totally dog people, we’re dog lovers—not dog owners. If we’re not house people, who are we? If we’re starting to have a different relationship to space and stuff, what does that mean? If we quiet the voices about how we’re supposed to live and what we’re supposed to want, what do we hear that’s really true for us? We began to realize we wanted less. Less space and less stuff. Less housework and less upkeep. Less overhead and less oversight. If you’re on your own, making a life-altering change can be a solo decision. But when you’re partnered up, it would be a tough compromise if one of you wants the McMansion and the other wants to go live in a Tiny House. Luckily, Hans and I were on the same page: We had a short list of new wants. For us, this meant we wanted to significantly reduce our square footage. We made a conscious choice to define “enough” for ourselves. We rejected “more is better” as a default and really thought about how much space we need to be comfortable and how many rooms we want to clean. All in all, we went from a house of 1,400 square feet to a hotel room of 300 (for six months while our apartment was under construction) to our current abode of 733 square feet. We have a kitchen, living room, bedroom, and bathroom. And I can honestly say we’ve never been happier or felt closer. In fact, Hans and I joke that we could easily go lower, perhaps to 500 square feet. But, for now, our 733 square feet is home sweet home. We wanted to rent, not own. Home ownership has historically been something you’re supposed to want, save, and strive for. For me, renting an apartment equals freedom. Freedom from maintenance, but also the freedom to decide next month I want to move to Denver or Sweden. Home ownership, on the other hand, feels locked in, less fluid. I’m frequently asked: Don’t you feel like you’re just wasting money renting? Don’t you think you’ll regret not building up equity? My answer: No and no. We’re paying rent to buy a lifestyle that works for us. And while we’re not building up equity, day-to-day peace of mind is priceless. Of course, I’m not advocating apartment renting over home ownership for everyone. I’m only speaking to what I’ve come to realize is true for me—even as it goes against the societal norm. When you halve your square footage it follows you’ll need to do the same with your belongings. In our case, we also gave up a garage (aka: three walls lined with large blue storage bins), which meant dramatically reducing our possessions. In a smaller living space, every possession needs to earn its keep. Less square footage necessarily raises the bar for what comes into your home. Do I love it? Is it beautiful? Does it enhance my well-being? Is it functional? Do I use it? Does it reflect who I am today and where I’m headed—rather than keep me rooted in the past? Do I only have this out of guilt or obligation? Am I okay with the price I pay for owning it—the overhead to maintain, the time to clean, the cost to insure, etc.? I also noticed this about downsizing: Stuff is not just stuff. We have all kinds of complicated relationships with the things we own. In fact, at times it can feel like our stuff owns us rather than the other way around. When we decided to downsize, I realized I had to stop coping with life’s boo-boos, disappointments, and frustrations by acquiring more stuff. It’s easy to stuff feelings with stuff. They don’t call it “retail therapy” for nothing. I also had to untangle my relationship to my belongings. For instance, if I get rid of something my grandmother gave me, does that mean I didn’t love her? Of course not, but it can be challenging to look at items objectively and separate the person from the thing. We wanted to live in a walkable downtown. When we decided to downsize we were lucky to already be living in a city with great walkability. In fact, Ann Arbor is often rated as one of the most walkable communities in the country. We wanted to be able to stroll to a nearby restaurant for dinner on Friday night and walk to the farmer’s market on Saturday morning. We wanted to be able to walk to the post office, library, cafes, and movie theaters. We all value different things, so walkability won’t be at the top of everyone’s list. The key is taking time to really consider what’s most important and be intentional about the kind of life you create around that. We wanted to be car-free. In some ways living without a car has been even more interesting than downsizing. I’ve had a driver’s license and a car since I was sixteen years old. While Hans lived for a time in New York and L.A. without a car, he’d become accustomed to the convenience of 24/7 access to his own set of wheels. So why did we want to be car free? We could just have easily changed our living situation and kept our car. It was simply the answer to this question “How much overhead do we want to support?” Because even when you own your car (as we did), there’s the ongoing overhead of gas, insurance, registration, maintenance, repairs, parking, etc. It comes back to knowing ourselves and embracing who we really are. I’ll say it again: Hans and I are not big on too much responsibility and obligation. Owning a car feels like both. If public transportation or walking are not options, we get a Zip car for an hour or two or book a rental car for longer weekend trips. We make living without a car an adventure rather than a sacrifice. There’s something fun about figuring out how to get from Point A to Point B when you can’t just step outside and hop in your car. And I never say, We don’t have a car—as if it’s about scarcity. I always say, We are car-free to emphasize it’s a choice, an intentional act. 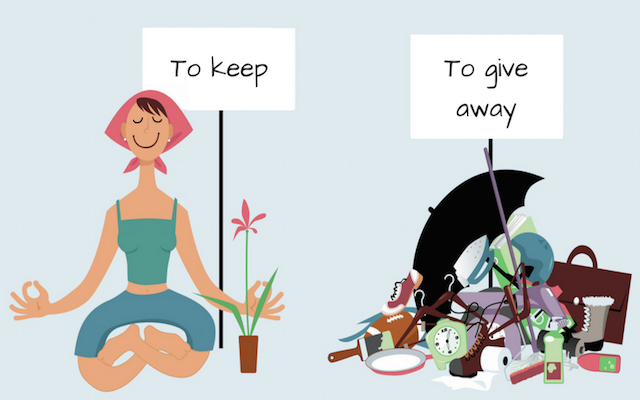 Our journey of downsizing and living with less stuff has been one of redefining “enough.” Of figuring out the disconnect between what we thought we wanted and what we really wanted. We have far fewer possessions and so much more time and freedom. With less square footage, we have less housework, less upkeep—and less stress. Can you say less really is more? Here are ten journaling prompts to help you explore your relationship to your stuff and your space. 1. What do you believe about how much living space you need? Where do those beliefs come from? Have they changed over the years? 2. Look around your home. Is everything useful or beautiful? 3. What truth about yourself are you on the verge of embracing? What will be different or possible when you embace this truth? 4. Do you think we live in a more-is-better consumer culture? How does this play out—or not—in your life? In what ways is less more? 5. Is there anything about your life that looks great on the outside, but doesn’t feel so great on the inside? What can you do to close this gap? 6. What is your definition of “enough”? 7. “Stuff is not just stuff. In fact, at times it can feel like our stuff owns us rather than the other way around.” Agree or disagree? Be specific by stating why. 8. Have you ever tried to shop away boredom, worry, or pain? What’s your experience with “retail therapy”? 9. What five factors are most important when it comes to your lifestyle wish list? 10. We don’t have a car versus We are car-free. How can you use this type of distinction in your own life to emphasize choice and intention?